Female. Taken in the Vercors NP, France, on July 24th 2018. Underside. Taken in the Vercors NP, France, on July 24th 2018. 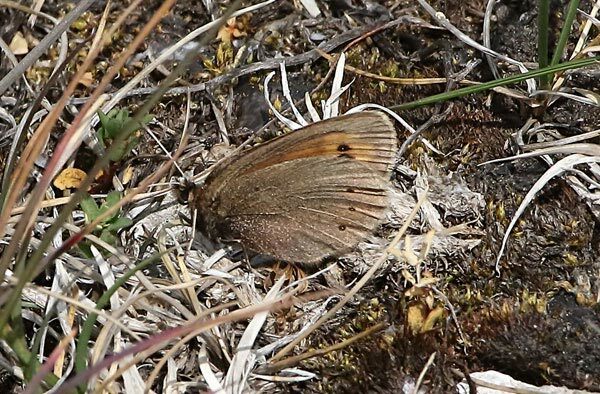 The Mountain Ringlet has orange bands on its upper surfaces, which are often broken into small blotches. The bands contain small black dots (usually four on the upper wings and three on the lower). The hindwing underside is grey-brown. This European endemic is widespread through most continental mountain ranges. It occurs in the English Lake District and in western central Scotland. 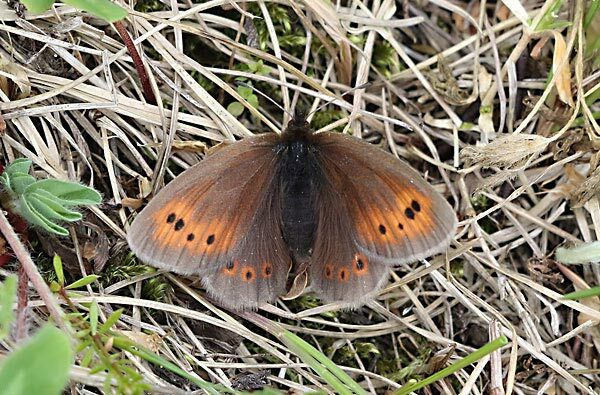 It is found in forest clearings, heaths and moors, marshy mountain slopes and grassy tundra, generally above 1200m. There is one brood per year between early June and late August, depending on altitude. In the UK adults emerge at the start of June in the Lake District and early July in Scotland. Bilberry, Tormentil and Heath bedstraw are used as nectar sources. Adults only fly in bright sunshine, and shelter in grass tussocks in poor weather. This species has Near-threatened status on the UK list.